Peru has a very diverse nature. But we had only 25 minutes long class on engoo.com and we discussed life in mountains. The teacher Carmen likes photography, traveling. She was in Peruvian mountains The Andes many times. I asked her about her experiences of being on the highland. And what I wrote down. There is a lack of oxygen on the high attitude 4500 meters above sea level. The usual reaction of the human body is feeling stomach pain or vomiting. Somebody tends to sleep. And it is very cold. Sounds not so attractive for the beginning of the trip? Don't panic. Tourists bring coca-tea. It made from coca plant and it drinks hot. It takes in average one day for adapting the body to the environment. The tourists started to enjoy being there on the second and following days. There are some animals which we can find only in Peru. The double l in name llamas pronounce as lj. Other typical for Peru animals are vicuñas and alpacas. They are fed by hay. 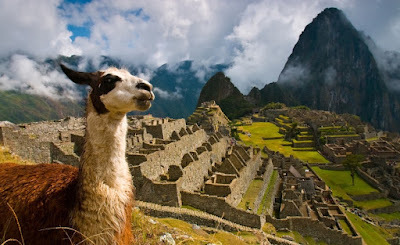 Cusco was the historic capital of the Inca Empire from the 13th until the 16th-century Spanish conquest. Its elevation is around 3,400 m.
Machu Picchu is a 15th-century Inca citadel situated on a mountain ridge 2,430 meters above sea level. The Incas built the estate around 1450 but abandoned it a century later at the time of the Spanish Conquest. Both places Were declared a World Heritage Site by UNESCO. These places in Peru are located at high altitude - typically much higher than you'll find in the rest of the world. The potential for altitude sickness is very real. One wrong turn from being lightheaded or out of breath can most certainly be fatal. So don't derail your train trip to Machu Picchu being stuck in an oxygenated hotel (or hospital) by insisting on starting your journey straight from the airport. Be smart. be prepared, and you'll have the time of your life.